What makes us the best facial in Citrus Heights? Knowledge, environment, customer service, touch. The best facial experience starts with the right environment; low lighting during your service, calm spa music, a relaxing blend of essentials oils swirling in the air and most importantly a comfy table. Once you are tucked in under the warm blanket and sheets we start with the treatment with our professional double cleanse under steam. 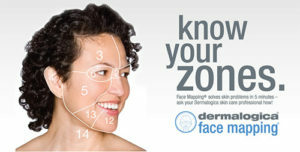 Next is our Face Mapping skin analysis, we touch and examine your skin under a specialized magnifying lamp, going zone by zone to address each zone’s unique needs. Face Mapping determines the rest of your treatment plan, which exfoliant is used, whether or not extractions are necessary, what massage technique is performed and finally what masque will address your specific concerns. To ensure you receive the best facial in Citrus Heights we customize each treatment to your skin, no cookie cutter facials here! Your treatment plan is determined by our Dermalogica Expert Skin Therapist. As a Dermalogica Expert Skin Therapist we have taken many, many, hours (200 +) in continuing education to know the skin inside and out as well as advanced techniques, modality use and extensive knowledge of professional skin care line Dermalogica. Each treatment is concluded with steamed towels customized with Hydro essentials to nourish your skin during removal of products. After eye cream, moisturizer and sun protection, we go over your Face Mapping sheet including which home care products to keep up your results until your next treatment. Each step is explained and numbered for ease of use.